UPDATE: Guided tours of “Fallen Star” Tuesdays and Thursdays 11 a.m. to 2 p.m. The artist wasn’t sure it could be done. 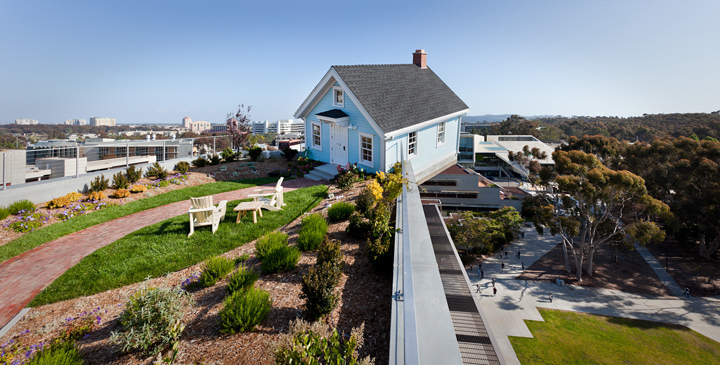 When Do Ho Suh first proposed “Fallen Star” to UC San Diego’s Stuart Collection, he “never thought it would be realized.” A cottage built from scratch and permanently joined to an existing campus building – several stories up in the air? Right, mm-hm. But there it is: Seven years after the initial sketch, the artwork is ready for visitors. It opens to the public on June 7, with a meet-the-artist event from 1 to 5 p.m.
“Fallen Star” is hard to miss. The 18th addition to the renowned collection of site-specific sculptures at UC San Diego is in a central campus location. It sits atop Jacobs Hall, also known as Engineering Building 1 – cantilevered at an angle from a corner of the seventh floor. The house was built during the fall of 2011. On Nov. 15, it was gently hoisted 100 feet and then attached to Jacobs Hall. It has since been furnished and accessorized. Its garden is growing: There’s a plum tree, a wisteria vine, tomatoes and more. Lights flicker on at night; a TV, too. And steam, simulating smoke, sometimes rises from the chimney. To some, imagining Oz, it might look like a tornado-tossed interloper from Kansas. To others, more biologically minded, perhaps like a small blue creature living in symbiosis with its much larger host. 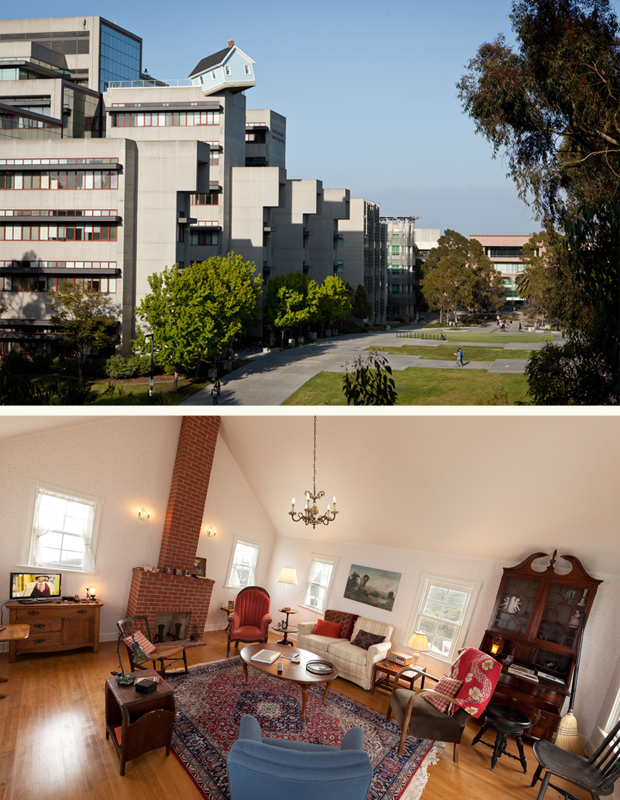 Either way, it can be seen from multiple vantage points on campus and off. Inside, people report awe – and vertigo. There are some amazing views of the campus, the Torrey Pines mesa all around. But then there’s the fact that, except for the chandelier hanging straight from the ceiling (thanks to gravity), there isn’t a single plumb line to the house. The floor of the artwork sits at a 5-degree angle from the flat roof of Jacobs Hall, while the house itself is built at a different 10-degree angle. “Fallen Star” conforms to California earthquake building codes and was built to withstand 100 mph winds. Its foundation is 18 inches thick, compared to the usual 4 inches. But people are perceptually tricked into feeling like they’re falling. Some feel seasick or wobbly. It’s disorienting. Yet it’s also familiar and cozy. Measuring 15 by 18 feet, the house is a three-quarter-sized version of a small house in Providence, Rhode Island. The found furniture is a bit worn and could have been grandma’s. There are family photos. Books. Touristy knickknacks. And the sorts of things you might see in a lived-in house: Keys on the coffee table. A cell phone. A remote. Suh said he’d like to see visitors, especially students, connect with the work. When the Korean-born artist first came to the United States, to study at the Rhode Island School of Design in 1991, he recalls feeling “as if he was dropped from the sky.” He had to physically and mentally readjust. Beebe hopes that these ideas are relevant for students, many of whom have left their homes for the first time and come from afar. “Home” – where we come from, where we are and how we got here – is a question we can all ponder. The project is supported entirely by private donations to the Stuart Collection and a $90,000 grant from the National Endowment for the Arts. Also “making the impossible possible,” Beebe said, were the project team, including Hodges and Hodges, architects; Spurlock Poirier, landscape architects; Walsh Structural Engineering; and Pacific Southwest Structures, Inc.
On June 7, refreshments will be served in Warren Mall. People are invited to meet the artist and view the new sculpture. No reservations are required for the opening event. Do Huh Suh was born in Korea and attended Seoul National University before going on to earn a BFA in painting from the Rhode Island School of Design and an MFA in sculpture from Yale University. Today he lives and works in New York, London and Seoul. His works are part of museum collections around the world, including the Museum of Modern Art, New York; the Whitney Museum of American Art, New York; the Solomon R. Guggenheim Museum, New York; the Walker Art Center, Minneapolis, MN; the Tate Modern, London, UK, Artsonje Center, Seoul, Korea; and the Mori Art Museum, Tokyo, Japan. Currently he has a solo exhibition at the Leeum Samsung Museum of Art in Seoul, Korea. The Stuart Collection commissions outdoor, site-specific artworks for UC San Diego’s 1,200-acre campus. The innovative collection is unusual in that the entire campus may be considered as sites for the artworks, university buildings included. Major works for the Stuart Collection have been completed by Terry Allen, Michael Asher, John Baldessari, Niki de Saint Phalle, Jackie Ferrara, Ian Hamilton Finlay, Richard Fleischner, Tim Hawkinson, Jenny Holzer, Robert Irwin, Barbara Kruger, Elizabeth Murray, Bruce Nauman, Nam June Paik, Alexis Smith, Kiki Smith, Do Ho Suh and William Wegman.